Every once in a while, a tool becomes an indispensable part of everyday life. We’ve certainly experienced this phenomenon with smart phones, then tablets, email, web browsing, and for some, Facebook, Twitter, and other social networking activities. During the past few months, I have retrained myself so that all notes are dated, tagged, written and stored in Evernote. And every task, every to-do, every reminder is logged in a capable, well-designed software application called OmniFocus. I no longer make random lists (well, almost never). When something needs to get done, I enter it into OmniFocus. What I like about Evernote, I like (or will soon like) about OmniFocus. I’m busy, I jot down a note or reminder on my iPhone, and I can fetch it, adding details or changes as I wish, on my iPad, or office iMac. (The one thing that I like even more about Evernote is that I can also access everything via any web browser, but that has not been much of an issue when I use OmniFocus because I always have a OmniFocus device with me). So what’s the big deal about OmniFocus? There are dozens of to-do and reminder apps, with sync, available for far less than OmniFocus. Wunderlist is free, and so is Appigo’s To Do (available in Pro edition for $19.99 per year); Things for iPad costs $19.99, and OmniFocus costs twice as much. For me, the key to OmniFocus and its value is a view of tasks by date. Sounds like every other task management software, like every GTD (“getting things done”) app, but that assessment is not quite right. Allow me to run through a task, an illustration of how OmniFocus is used to run much of my life. Although it is possible to make a quick task entry, the more complete entry panel is more useful. After naming the task, I select a context from my own list that includes: Awaiting Response, Call, Create, First Contact, Followup, Just Do It, On Hold, Purchase, Research, Schedule, Visit Web Site, and Write. Then, I select a project, again from my own list that includes: Art, Books, Digital Insider, Home, Music, Software, Travel, Web Site, and various, specific work-related projects. I can stop there, deciding to add a flag to any high-priority tasks, but I prefer to add a due date to every task (start dates are also an option, but I don’t work that way). There’s a nice big note field, and I use hat to capture URLs, reminders of the most recent attempted contact (left phone message on 3.13.2013; sent reminder email on 10.12.2012). I can add a photograph, .jog, .gif, .png, or record an audio message. That’s how I compose each task. Note that there are no priority levels (three stars for most important, two for moderate importance), and no color coding for each category (Music is red, Books are purple). I used these often when Appigo’s To Do was my management system. It looked pretty, but I seemed to spend more time futzing than actually, you know, getting things done. So, that’s half of the story. The other half us a very reasonable view called Forecast. On the iPad, along the top, there are a series of boxes, each with a date and a number of due tasks. I click on Saturday, May 4 and I see the four tasks that are due on that day. I click on Monday, May 6 and I see the list of 13 tasks I have assigned to that date. Each task is clearly identified by its context (Digital Insider, Home, Music, etc.) In addition, down at the bottom of the screen, I see a quick view of my day’s calendar (among my few criticisms: I would be happier with even a hint of what meeting was represented by each of the schedule bars). Still, in a single screen view, I can assess my entire day and make way through all that I intend to get done. I’m surprised that so few task programs also offer this calendar feature; in fact, this was the single feature that initially drew me to OmniFocus. Apple includes a geo-location feature in its Reminders app, and OmniFocus does the same. Of course, I can survey every task by looking at a context-based organization of the tasks on one screen, or a projects-based list on another. This is sometimes useful, but I much prefer the date view (I guess I think in terms of what I want to do today, not what I want to write for Digital Insider over the next few weeks). I find myself sending tasks from Safari, but some bookmark manipulation is required to do so (common among Apple and iOS products, a silly misstep on Apple’s part; I don’t know about the Android equivalent, but someone might comment on that question). 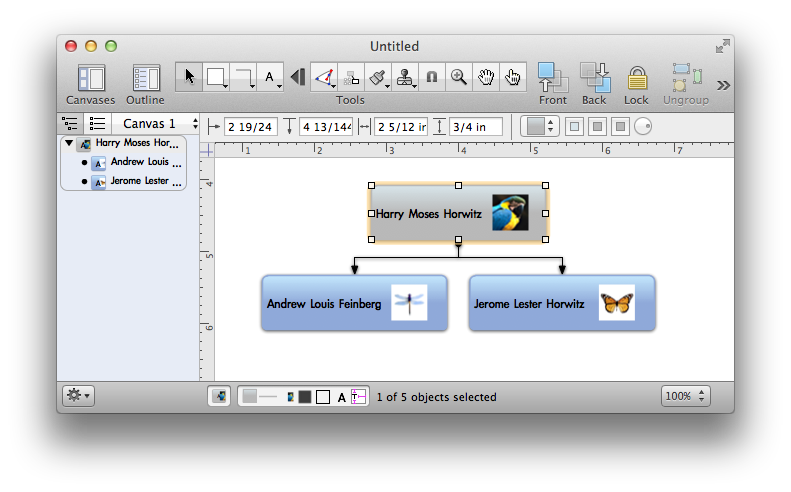 Apple (and other users) are accustomed to seeing tasks organized not only by time but by place. In OmniFocus, this feature is especially well integrated. Another useful feature, which I ought to use more often, is called Review. It allows management of categories by group (for example, I can de-activate Art for a while), or place a group of items on hold. I prefer to work at the individual task level, but I probably could save some time and operate even more efficiently by using Review. On the iPhone, I get just about everything that’s available on the iPad version. In fact, the day’s schedule does list specific events, a feature not available on iPad (yet?). How about the desktop version? Well, it’s available, but the current iOS versions are so good, OmniGroup is redesigning the desktop version to match the feature set. Apparently, the Beta testing is going quite well; from time to time, the publisher offers an update on the company’s blog. The new release will be tied to a fresh syncing approach called OmniPresence, also described in the blog. With all of this positivity, I supposed that you should know that OmniGroup is a leading developer of Mac and iOS products, but these products are not available for Windows or Android. That’s too bad, and, I suppose the company’s executives keep wondering whether to continue to excel in the Apple world, or whether to expand so that their good work can be appreciated by users of other systems. 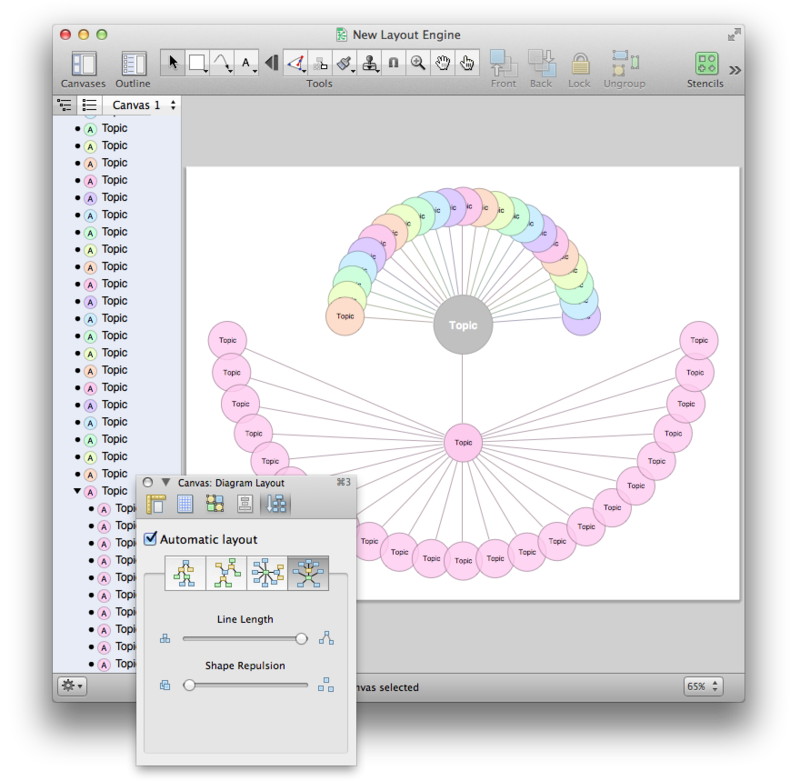 In fact, this is the second Omni product I have written about in this blog (OmniGraffle was the first; it’s a diagramming program that I use all of the time), and I’m anxious to write about another one, OmniOutliner, another product being redesigned for desktop because the mobile version has been so warmly received. Would I change anything about this program? Well, just a few things. First, I think I would offer flags in at least three colors, just to add a bit of additional “hey this is pretty important” highlighting (priority levels would only confuse an elegantly simple approach, so I would leave that alone). And, I wish I could see the names of my appointments on the iPad as I can on the iPhone. A means of web access would be nice, but it’s hardly essential. Overall, based upon daily use for months, I wholeheartedly recommend OmniFocus to people who (a) tend to be very busy, and tend to manage many of their own tasks; (b) believe that good organization and clear task lists make it possible to get things done more efficiently and effectively (if you’re not a believer, there’s no point in any of this), and (c) require a more professionally-oriented system than most products in App Store provide. If you’re just working out shopping lists, OmniFocus can do the job, but so can a lot of other software. If you’re attempting to manage a business life, or a busy personal life, OmniFocus is probably a wise choice. Tablets are spectacular inventions, but, as a rule, their internal loudspeakers do a poor job reproducing sound. With tiny loudspeaker drivers, often pointing in any direction except toward your ears, assisted by an amplifier never intended to seriously reproduce music, even the most appealing iPad is so uninterested in music, it contains only a single monaural loudspeaker. Most people either enjoy the experience as-is, and don’t worry much about fidelity. Or, they use a pair of stereo headphones and enjoy the kind of audio that seems to exist inside the tablet (or phone), but won’t come out without some sort of accessory. For months, I’ve been seeking a portable speaker for use with a tablet, or a phone, that provides the seemingly impossible combination of small size, convenient weight, sufficient amplification for listening at desk or in a bedroom, and, most important of all, clarity across the dynamic range (that is: nice clear highs, credible mid-tones and, perhaps most difficult in a tiny setup, bass is crisp and well-defined). FoxL, basic model, front view, now apparently on sale for about $120. At a trade show, I found what I was looking for. It comes from a small company called soundmatters and it goes by the name of FoxL. In fact, there are several models. The core of these devices is a hybrid loudspeaker design that soundmatters calls a “Twoofer,” which combines “tweeter” and ‘woofer.” This design allows a dynamic range that begins as low as 80Hz, or roughly what you would hear from a good tabletop stereo system, and also allows highs in the 20KHz range, which seems fairly commonplace. These speakers fit into a ruggedly constructed (mostly) metal box that is, truly, pocketable. The dimensions: 5.6 inches wide, 2.2 inches high, and 1.4 inches deep. It’s about the size of an eyeglass case. It weighs 9.5 ounces. (By comparison, the popular JAMBOX weighs 12 ounces, and, overall, it’s about 20 percent larger). Does the size matter? For a portable device, sure it does… the smaller (and lighter) the device, the more likely I will take it along in my shoulder bag. But only if it sounds (very) good. Right now, I’m listening to a recording by The Lincoln Center Jazz Orchestra led by Wynton Marsalis. The album is called Live in Swing City, and the tune is a complicated arrangement called “Chinoiserie” and it contains some very aggressive performances, lots of solos, deep notes, a barking saxophone, a sweet backup horn section, and a live audience in the background. Not an easy combination for a so-so audio system. The results are excellent–but I am careful to keep the audio level no higher than about 80% on both the iPad and the FoxL (which contains its own amplifier and volume control). The system can play louder, but bits of distortion and harshness make the listening just a bit unpleasant. For something completely different, I switched to Peter, Paul & Mary, a trio that was always well-recorded, and whose individual voices and harmonies are both distinctive and familiar. The album is See What Tomorrow Brings and the song is “If I Were Free.” Mary is singing lead, and the nuances of her vocal are presented with appropriate warmth, if just the slightest bit lacking in punch. The guitars and the male background vocals sound clear and wonderful. The opening guitar on “Early Morning Rain” and Paul Stookey’s vocal sound ideal, and once again, the vocals are right, too. The opening drums and other percussion on Vampire Weekend’s “Oxford Comma” grabs the listener with just the right power and clarity. The vocals sound fine. The more frenetic “Walcott” has enough bass and the right drum sound to fill a (very) small room. “Way Over Yonder in the Minor Key” by Wilco on their Woody Guthrie tribute album, Mermaid Avenue, also sounds right. The vocal is crisp and clear, and when the background vocals kick in, with the additional instrumentation, everything holds together beautifully. Dawn Upshaw brings her operatic voice to artful arrangements of Weill, Bernstein and other 20th century heroes on her album, I Wish It So. I’m very familiar with her version of Sondheim’s “There Won’t Be Trumpets” because it was one of a half dozen songs I used to test loudspeakers and sound systems for a feature story in Stereophile, a high-end audio magazine. Once again, Upshaw’s nuance in Upshaw’s voice is about right, but again, there’s a small lack of punch. Presence turns out to be less of an issue for Karan Casey, who brings her pretty Irish voice to the ballad “She Is Like The Sparrow” on her self-titled album, but the low string accompaniment must be played at about 70% to avoid distortion. When the sound level is monitored, and the FoxyL is placed on its soft rubberized mat (supplied), the presentation is rich and quite wonderful. Concerned about the occasional presence of distortion, I find some songs with distinctive and abundant bass. The little speakers sounded fine on Bonnie Raitt’s “Love Has No Pride,” and when Charlie Haden plays the bass behind James Cotton’s voice and harmonica on “All Walks of Life” from their Deep in the Blues album, the level of distortion was neither obvious nor troublesome. No problem on the Emerson Quartet’s version of various Beethoven String Quartets, either. In fact, they sounded terrific. All of my listening was done with an iPad2 connected, by a supplied cable (miniplug to miniplug) to the most basic FoxL model ($149). For fifty dollars more, you can buy a Bluetooth model (I’m not a huge fan of Bluetooth for music listening because the sound, inevitably, cuts in and out). Both will run for 12 hours on a single battery charge (charger included). An additional $30 buys a total of 20 hours of battery life and a pretty silver enclosure. You can also charge via USB. My one complaint: a poor design on the back of the device–an easel stand is made of plastic and can be difficult to open. Visit the website to learn more about an accessory subwoofer (also quite small) that plugs into any FoxL device. MacRumors published an interesting article about the new full-sized iPad, the one that will become available by September or October of this year. The new model will be about 1 inch less wide, and about 2mm thinner than the current iPad Retina Display. 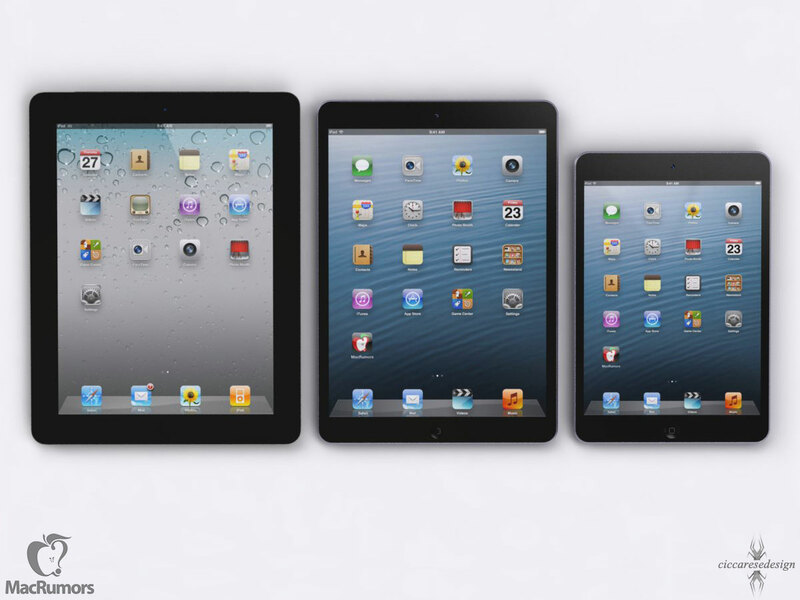 It will resemble the current iPad Mini, which employs a far thinner border on the left and right sides of the screen. 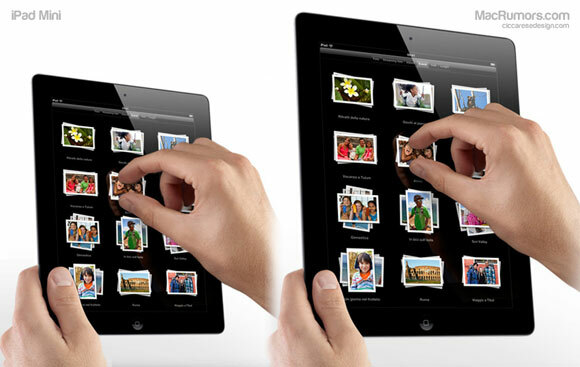 And, in case you missed it, Apple introduced a new 128 GB version of the current iPad this week. It’s now available, and, I suspect, autumn will bring a 32 GB, 64 GB and 128 GB model, with no more 16 GB iPads after this year. I really like MacRumors. They hold their sources to very high standards, and if they’re not always 100% on the money, their revelations are consistently sane, reasonable, and forward-thinking. Good idea #1 – On every iPad, Apple includes a slot for an SD card. That way, I can copy a file from my computer, insert it into the player without any fuss, and edit a document or watch a movie. Good idea #2 – Recognizing the error of its ways, Apple introduces a $30 accessory called the Camera Connection Kit. It includes two small white blocks, one of which allows the insertion of an SD card into an iPad. But only for transferring pictures. Forget about editing a Pages or Numbers file, or watching a movie. Good idea #3 – Seagate introduces GoFlex, a lightweight, portable disk drive that connects, wirelessly, to any iPad. The secret is a wireless network created by the device; that’s how the connection to the iPad is made. The capacity is 500GB, a very healthy amount of space for all sorts of files. Unfortunately, Seagate’s interface technology proves difficult to use, and, at least for me, it seems to work less often than other devices. (Seagate has provided help, not once but several times. New Year’s Resolution: Since I love this idea, I will try again and get it right.) It costs less than $200. Good idea #4 – Maxell introduces AirStash. It’s a small wireless network, and it worked the first time. There are three parts, well-integrated. The first is an app, clean and simple, just a list of files organized by file type (movies, etc.) The second in an SD card (up to 32GB). You insert the SD card into your computer, load it up with files, and plug it into the third part. That’s a device roughly the size of a large cigarette lighter. On one end: an SD card slot. On the other, well, nothing you need to make the connection (more on that in a moment). You find the AirStash network in the list of available wireless networks, make the connection, return to the app, and just watch the movie (or whatever it is you want to do). From time to time, you need to recharge the AirStash battery–that’s the third part, a USB plug that you insert into any computer or USB/AC adapter for the recharge. My test device was loaded with several good films: I watched The King’s Speech and Inception, and both played flawlessly. Good idea #5: AirStash is updated so that it can be used without shutting down the WiFi network that you usually use. Right now, that’s a flaw. I hope it will be fixed. Here’s a look at the AirStash app for the iPhone. Simple, straightforward and intuitive. 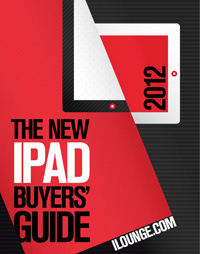 First–and this one is free–is the 150-plus page iPad Buyer’s Guide from iLounge. If any one publication is the definitive iPad guide, this must be it. It begins with a very complete guide to every iPad model on the planet–very useful for those who are considering a purchase, a skip-over for those who already own one–then digs into articles about iPad innovators, including Inkling (which makes the interactive travel guides I wrote about last week). Just about every aspect of the iPad culture is explored, including some decidedly weird comments from the doubters (I thought we were past this negative stuff, but obviously, they do not). There are pages and pages about useful accessories, top apps, lots more. What’s more, everything is presented in a punchy, fun-to-browse way. It’s available for your computer screen in one-page or two-page-spread format, or in one-page specifically for the iPad. Nice work! Second, a surprise, at least to me. I’ve used an iPhone for years, and an iPad for a year or so. The input device is my finger, and until yesterday, that worked just fine. Just for fun, I tried an iPad stylus. I liked it. A lot. 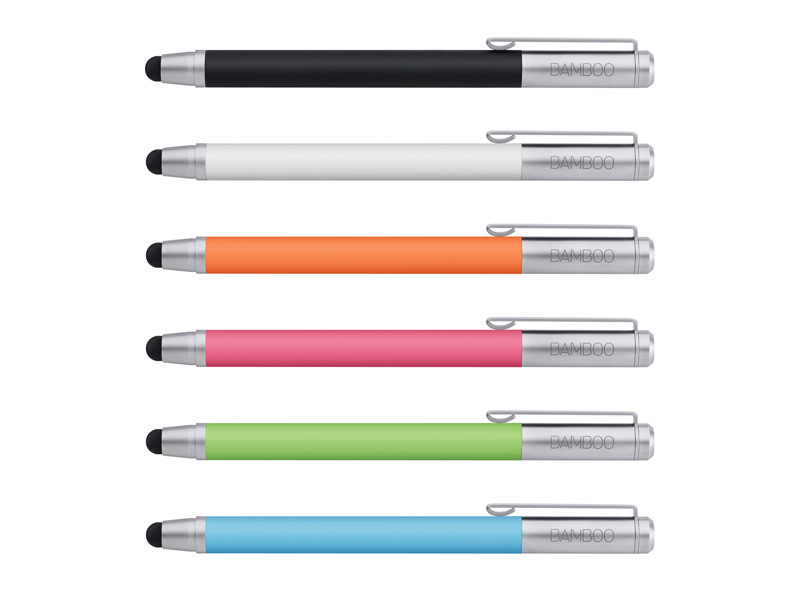 There are lots of iPad styli available–including the colorful series of Bamboo stylus products from Wacom, and the one I used, the AluPen from Just|Mobile. The AluPen is about four inches long, and feels like a fat crayon. The rubber tip makes contact with the screen’s surface with surprising accuracy. I was able to execute every iPad function more smoothly (and with no fingertip oil or friction), so the experience seemed smoother, quicker, and more precise. Consistent with current trends, stylus makers now offer two models, one with a built-in pen (the kind you use to write on paper, the kind with ink). The AluPen Pro uses Pelikan ink, which seems consistent with Just|Mobile’s higher-quality approach to their whole product line. Before you buy, be sure to explore the extensive text, pictures and video on The Verge. Third, remote power. At January’s Consumer Electronics Show, lots of companies were showing remote power accessories for both iPhone and iPad. Once again, I was impressed by the Just|Mobile products, despite their odd name: Gum. The Gum Plus is the smaller unit, designed mostly for the iPhone (which it can charge several times without being refreshed), and, in a pinch, you can use it to charge the iPad, if not fully, then enough to keep working for a while. For the iPad, you’ll want the larger, and somewhat heavier, Gum Max, which carries enough portable power to completely recharge an iPad, and then, an iPhone. The way this works: you plug the GUM into your AC outlet, fill it with power, and then, carry it with you. 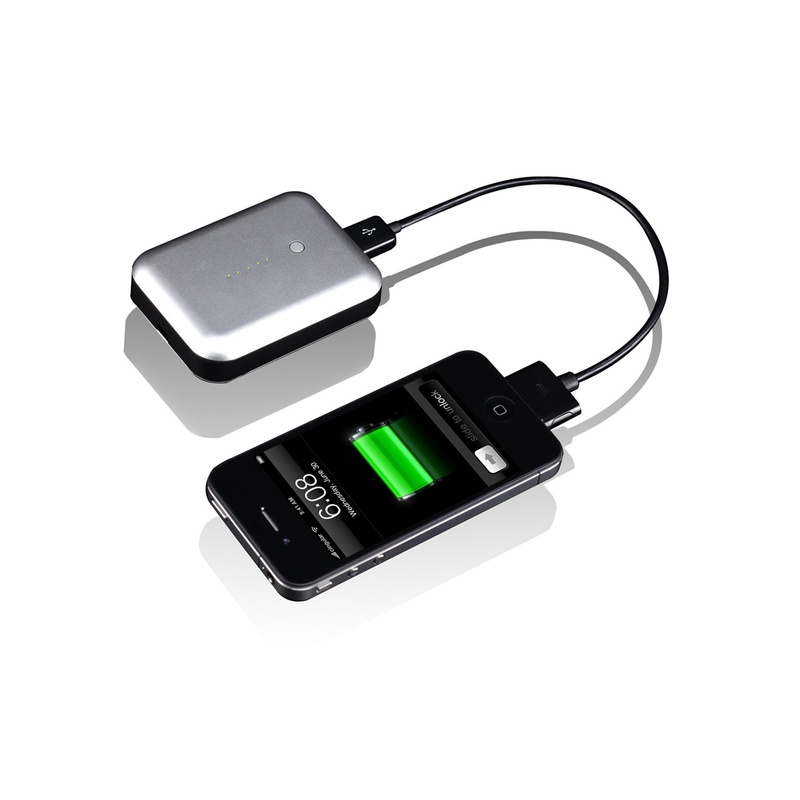 When you need the power, you plug your iPhone or iPad into the portable GUM unit. Then, when time and access permit, you recharge the GUM, and, presumably, your iPhone and iPad, too. Some people will use these devices regularly. If you plan to use the Gum only sometimes, you must remember to discharge and recharge the unit for best results. Fourth, remote storage. Apple designed the iPad so that its local storage would be limited… and the cloud would provide the rest. Unfortunately, even 64GB is not enough local storage for those who rely upon the iPad as their primary portable device, and there is no such thing as a USB Flash Drive or SD Card to augment storage. I am very impressed with the idea of the Seagate’s GoFlex Satellite Drive, and as soon as it’s up and running, I will report back to you. I reposted because I forgot my favorite new iPad accessory. It’s an eraser. But it doesn’t erase ink or pencil. It erases the ridiculous smudges that magically appear on every iPad screen. I use it often, especially on sunny days when the reflected finger grease (sorry) makes it difficult to see the screen properly. So, here’s the solid plastic 3-inch by 4-inch white plastic eraser with a specially-made black bottom…my best friend when the smudges become annoying on an otherwise beautiful day. The company is Best iProducts. The iEraser costs $14.95, and it’s proudly made in America. They can imprint company logos. It works on a bare screen, but not with a screen protector. All of which is nice to know, but what I really like is that this little eraser really works. First time, every time. Smudges gone! And it couldn’t be simpler. Small company, good product, who could ask for anything more?